Robert Burns was an early exponent of Art Nouveau in Scotland and an outstanding decorative artist. He became head of painting at Edinburgh College of Art while also engaging in commercial projects involving a variety of materials, following the tenets of the Arts and Crafts movement. 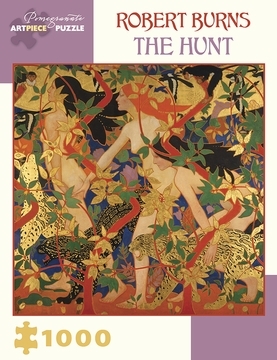 Burns created The Hunt (previously known as Diana and Her Nymphs) as part of his most famous interior-design project—an ambitious first-floor decoration for Crawford’s Tea Rooms at 70 Princes Street, Edinburgh. The panel’s vibrant colors and patterns provide an exotic jungle-like setting for the Greek goddess. Wild birds and animals, including the striking leopards, allude to Diana’s role as goddess of hunting. The work’s exuberant rhythm and energy are characteristic of 1920s design.